As a child, Heather Arnold moved frequently, attending at least 12 different schools between kindergarten and graduation. Finding continuity in the face of so much change was difficult, but she found solace in the music departments at her schools. “By taking part in music classes, I was immediately involved in a group of people with the same interests as myself,” says Arnold. Her love of music endures. Arnold now teaches music at Sunrise Elementary in the Northshore School District and is the assistant conductor of the Kirkland Choral Society. Music programs in schools contribute more to students’ growth and development than the social bonds the experience often fosters. “Playing instruments or singing enhances coordination, concentration and memory — skills vital to academic learning,” Arnold says. Children use abstract reasoning to translate musical notes and spatial-temporal ability to play an instrument. “Music has a fundamental developmental impact on the brain,” she says. There’s convincing evidence that the arts — music, theater, visual arts, and dance — are more important now than ever. In a 2010 study conducted by IBM, more than 1,500 CEOs from around the world were asked to identify what they felt was the most important leadership competency for future success in business. The quality that topped the list? Creativity. When school districts face budget cuts, creative subjects such as music are often the first to be targeted. But when parents raise their voices, they can sometimes make a difference. Last year, the Kent School District proposed eliminating elementary music programs. An outcry from the Kent community followed. “Enough parents got up at board meetings to say, ‘We’re done with music being put on the cutting list,’” says Kent Elementary School music teacher Karen Martin. The district didn’t make the cuts. “Parents have the biggest voice in educational change,” says Martin. The arts programs in Seattle Public Schools vary, according to Carri Campbell, visual and performing arts manager for the district. 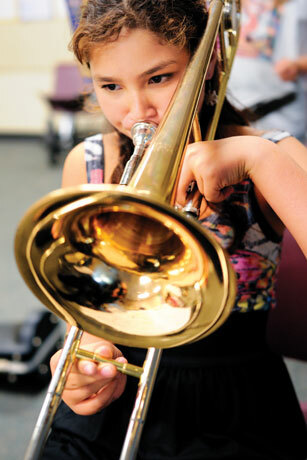 Some schools are very focused on music; others emphasize visual arts, theater or dance. That’s because arts staffing and funding decisions are made at the school level, not centrally for the entire district. This system works well for many schools, says Campbell. The downside? If a particular school principal isn’t an arts proponent, that school could end up without an arts teacher. Two years ago, when the district switched from a “choice” model of enrollment to a neighborhood school model, parents wanted assurances that they wouldn’t be giving up their beloved music programs. “This was something our community demanded, because they were accustomed to shopping for arts-rich schools, particularly for music,” says Campbell. In response, through a partnership with the City of Seattle, the district has allocated a little more than $1.2 million as part of a transition plan to deliver more equitable access to quality music programs across the district. Of that amount, $500,000 has been put toward the purchase of new instruments — the largest investment since the 1970s. Starting next year, every K–8 school will have a music program. “There has been an upswing in the provision of music in the last couple of years,” says Campbell. Many Seattle public schools are already doing a great job at making music a priority for their students. View Ridge and Thurgood Marshall are examples of elementary schools with thriving music programs, says Campbell. At the middle school level, the programs at Denny International, Hamilton International, Eckstein and Orca K–8 are going strong. Edmonds School District has been named a “Best Community for Music Education” by the National Association of Music Merchants Foundation. Scott Barnes, manager of visual and performing arts for the district, attributes this success to community support and the dedication of excellent music teachers. “To help provide access to all students, the district has cultivated community partnerships to provide instruments at low cost, or no cost, to students who would otherwise not be able to participate,” says Barnes. Fifteen years ago, Pam Schroeder, Bellevue School District arts coordinator, conducted a survey on participation rates in Bellevue fifth-grade instrumental music programs. According to the report, when instrumental music was offered outside of the school day as an optional program, participation dropped dramatically. “I proposed that we just make it a part of the school day and that we would take all students,” says Schroeder. Parent involvement is essential when it comes to supporting music programs. McAlinden urges parents to talk with teachers and principals about how crucial music and arts programs are for students. “Ask your educational leaders about their plan for the arts, and let them know that the arts must be provided fairly to all students,” she says. Research how children benefit from quality public school music programs. Find out what is going on in the schools your children will attend. If parents know what good music education looks like, they can advocate that for their child. And check out ArtsEd Washington. Show up at school board meetings. Share what you’ve learned about the importance of music education with school and district leaders, and communicate your expectations. Go to the Washington Music Educators Association website for information. Email legislators about the importance of adequate music education funding. Because the arts are a core subject, they need to be funded by the state as basic education. It typically takes only about seven emails from concerned parents for legislators to take notice.